Words cannot express how thankful I am to have you in my life. You were such a strong influence during my preparation for Miss Twin Cities. Thank you for all of the phone interviews! You are always there to offer me clothes, shoes, and earrings, whatever it takes me to looking my best. 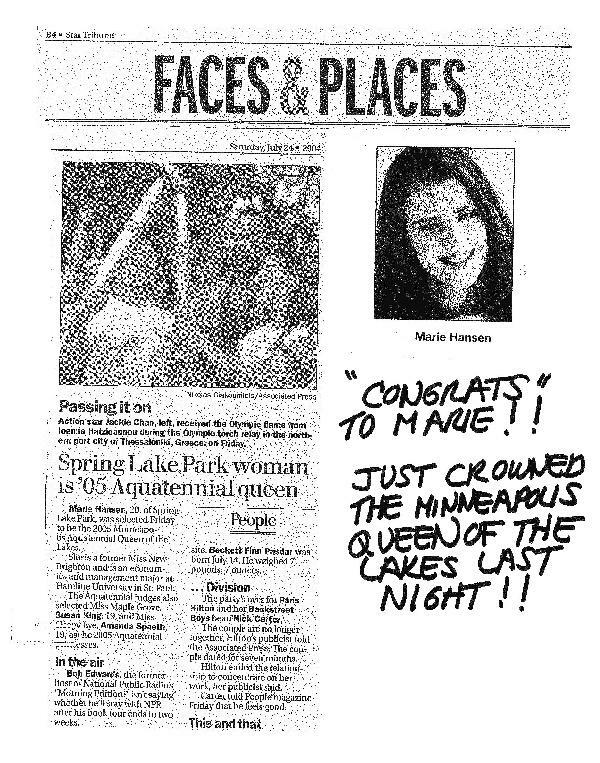 Also, I appreciate you coming to the Miss Twin Cities pageant to cheer me on and see my crowning moment! The bracelet you gave me is too cute and matches perfectly with my leather jacket! Once again, thank you for all of your help! Thank you for all your help with Lindsey getting her ready for Aquatennial. She went home after your appointment and read the history of Aquatennial and it was a good thing she did. Her first question was "tell me something about an event that you miss at Aquatennial". She had the answer from your talk of the Follies. You were also right about the color of the suit, she changed it to the royal blue that you suggested and the judge could not stop telling her how great that color was on her. She was not chosen as the queen, but she had a great time and I did hear from some of the commitee members that they were very impressed on how well prepared she was. Thank you so much for putting on a wonderful graduation and including us. Dani felt honored to get to be a part of your program, and has enjoyed every minute of your school and working with you! You are a great inspiration and a wonderful role model!!! Thank you again for everything that you have done for us. There will never be enough words to express how truly grateful I am that God brought you into my life. Because of you I am standing here today, the reigning 2008 National American Miss MN Teen! I never thought I would ever say these words, and because of your belief and dedication my dreams have finally been realized. I owe everything to you. Ever since day one when I walked into the school as a tomboy to today a State Queen, you have never stopped believing in me and pushing me to keep striving for that next level, and reaching for the stars. You brought out the best in me, and made me into the person I have always wanted to be. I have grown and matured with your guidance, wisdom, and love. You are my guardian angel and after two plus years, I have finally been able to spread my wings and fly. No one can compare to you. You truly have the talent to create winners and you should be very proud of yourself. Everyday that I walk into the school I look around and am constantly reminded by all the gorgeous smiles that you are the most amazing woman to ever walk this earth. I am a firm believer that everything happens for a reason, and it was because I met you, that I now have a crown and banner to call my own. You have become not only my boss and my dear friend, but a second mom. I know you will always be there. When I saw the tears in your eyes after the pageant I truly felt like I mattered, that I had achieved something great. Thank you from the bottom of my heart for just being you; for never straying in your hopes and dreams for me, and for always encouraging me to never give up. I am a walking billboard for "You Gotta Have Faith" and I do. I have you by my side, in my head, and forever in my heart. I love you Faith Schway! 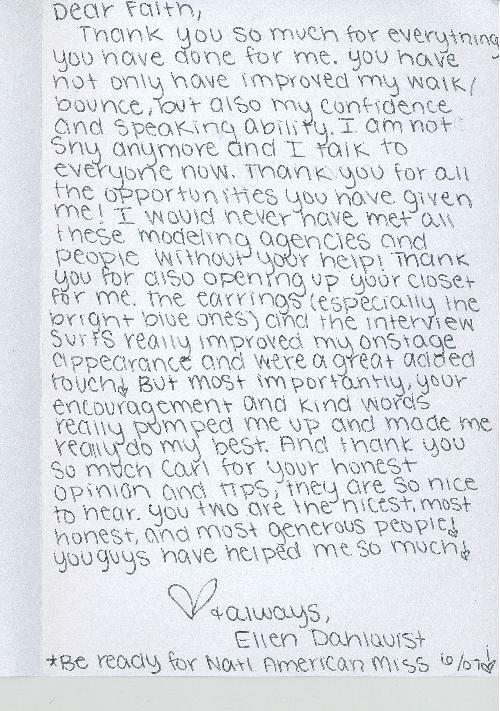 You and Carl are probably the nicest people that I have met in my whole life. I have never been welcomed into someone's life the way you two did. So genuine! It's beautiful! You are both so special to not only me but to my family. Thank you for your unconditional love and support. 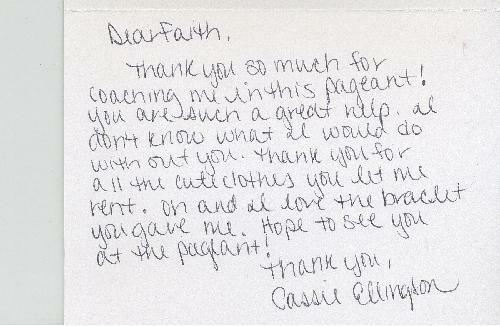 I haven't written you a proper thank you since you helped me so incredibly much in preparing for the pageant. Since I met you, I have learned and grown so much as a person. That day that we met at Panera was a true blessing! Thank you for seeing something in me and taking the time to help me to do something great. You are more amazing than any card can express. You are my life Faith! I adore you and look up to you beyond belief! You are such an amazing person and truly do make the world a mere beautiful and glamourous place! You have transformed me from a shy, self-conscience girl into a confident young woman with a crown on her head! You have given me so much. I know that I can trust you and could talk to you about anything! I love you so much, you really are like family to me and I am so thankful for you. You guys have done so much for me, this card is inadequate in comparison to how thankful I am to you both. I think the most meaningful thing to me was how much you both believed in me. It was your encouragement and inspiration that gave me the courage to give this a shot. I can not wait for our adventures and shopping trips together! The boots are amazing! I wear them everywhere! Thank you! Two people have touched my heart always and forever, Faith and Carl! You two are the reason why I"m here today. Faith, you showed a soccer player how to elegantly walk in 5-inch heels to become a "Beauty Queen". Believe me that took a lot of Faith, hard work, and dedication, traveling back and forth for three months to prepare for Teen USA 2004. I thank you for all the late night decisions on which purse goes with what and how my hair should look each day. Faith you are truly a beautiful person and mother inside and out! Faith! Oh my gosh! How great of you! It was so sweet of you to think of us. All those clothes are great!!! I have things to wear!! Thank you so much!! Thank you, thank you, I love everything! Oh, let me know when you would like to meet up again to practice. Thank you so much for all of your wonderful support over the years. Can you believe it's been 13 years since we've first met? I am who I am today so much because of you and what I have learned from you! Thank you for everything. I love you tons! 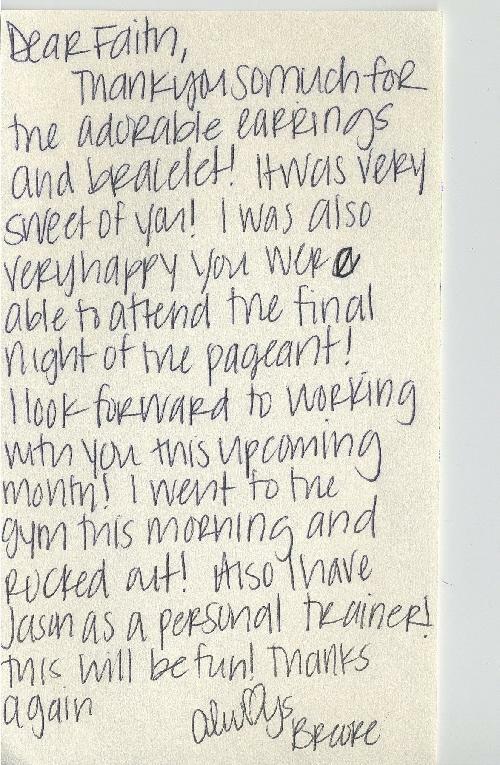 I can't thank you enough for all you have done for me as I prepared for Miss Minnesota America. Your encouragement is one of the reasons I ever ran for Miss Anoka County. Thank you for believing in me and for being a wonderful friend. Thanks so much for all your encouragement and your advice as I pursue my quest for the Ms. American Queen title. You really made me feel confident and worthy, and it was so reassuring to be able to call you with questions and emergencies. The weekend is finally here! I just wanted to thank you for everything you have done. I never could have done this without your generous help. I am very excited and ready to do my best! First off I would like to thank you for giving me the opportunity to attend Premiere. I loved it! I can't wait until graduation. 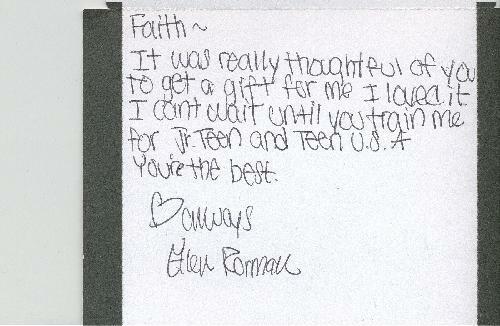 I hope someday you'll train me for Teen USA. 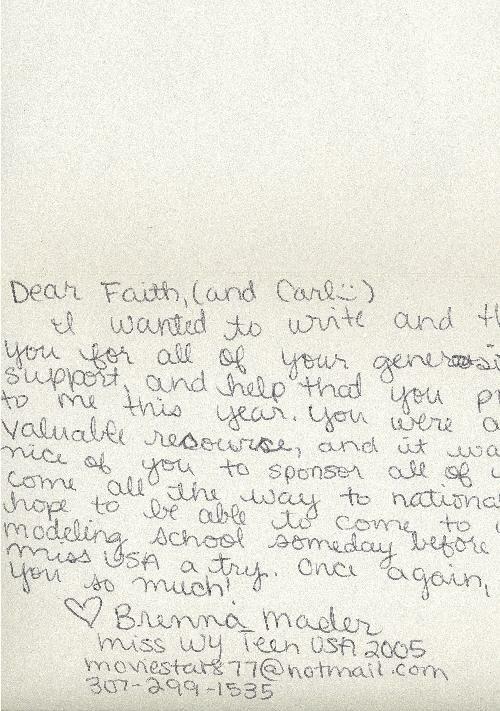 Thank you for your help in the Miss Teen USA Pageant. I had a blast and success getting into the top 15, thanks to you! You are a very kind lady and I would love to work with you again! I was recently a contestant in the Miss Minnesota Teen America Pageant and won the modeling and best style award I know, because of your famous 1-2-3 pose I finally got down! And not to mention some style from your unique fashion sense. The word faith means believe in God and he'll help make dreams come true. That's what you helped me see. Thank you so much for all you have done for me. I would not be the confident and outgoing person I am now with out you. You truly are a blessing. Thank you so much! You are an amazing person! Thank you so much for all your help, support and encouragement. 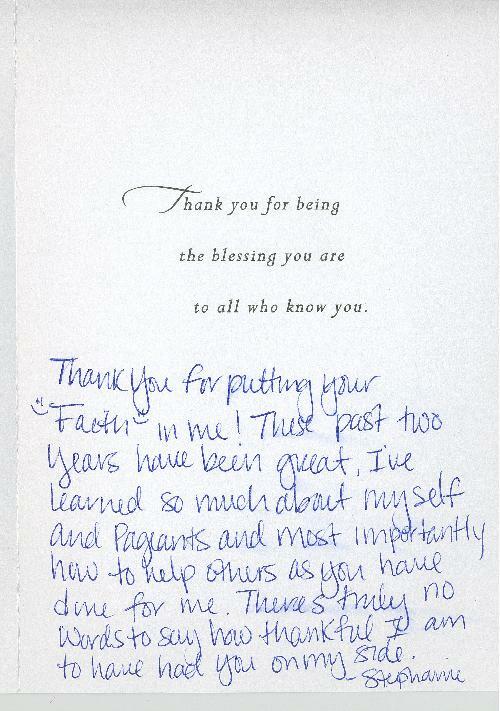 I feel so blessed to have such wonderful people behind me as I compete to become Miss North Dakota USA 2004! Thank you both so much for making my graduation party. Thank you for everything you've done for me in the past, especially with coaching me for Miss MN Teen USA and bringing out my confidence. I hope to do more modeling/pageants in the future with your help! Thank you for helping me be the best I can be! Thanks so much for working with me last week! I appreciate your time & patience! I will look forward to seeing you again. I am interested in getting together with you next time I am in town! Hi Faith and Carl- I won!! I took interview, evening gown and the national title in the Ms. Division, PLUS an overall national spirit award over all the categories. Thanks so much for all your coaching. Can't wait to see you again. There are no words that can truly express how grateful I am for all of your time and help! Not only are you amazing at what you do, you are an amazing person. You have become a friend and a support to me. Thank you for always believing in me. You have no idea how much it has meant these past six years. If you ever need my help with anything, let me know. I will gladly volunteer my time as you have for me! 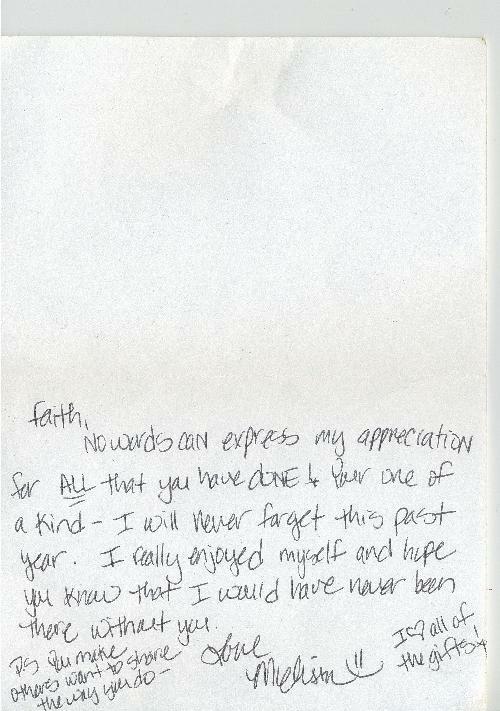 Thanks again, Faith. Thank you so much for the congratulatory flowers. They were so beautiful and appropriately white. I greatly appreciate all of your support and encouragement throughout the years. It was so nice to see you both at the Miss Richfield Pageant. I hope to see you again soon. 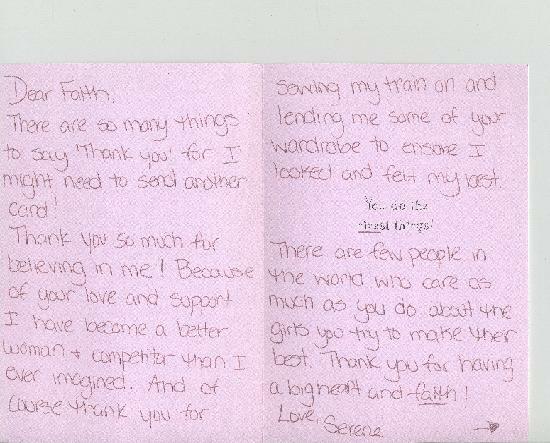 Faith, you are such a wonderful woman with such a big heart. Thanks for everything! Thank you so much for all of your help for the pageant this year. There is no way I would have gotten 1st runner-up in my very first pageant without you. You are such an amazing coach and friend. Let's discuss next year's pageant soon. Thank you so much for the beautiful frame. I love it. It is so special, wow. It is amazing to look back and see what a huge role in my life you have played. If I would have never met you, I would not be the woman I am today and would have completely different group of friends. Thank you so much for blessing and enriching my life. I would like to tell you thank you for all your hard work with me. All of those long trips to the Twin cities really paid off. A huge part of my success is because of you. Thank you so very much! I had the best time with the two of you! What wonderful people you are. I really got to know you both and have found that you guys are better than I thought. Thank you for the wonderful time you allowed me to have. I've learned so much from this trip. That was the best Premiere school graduation party yet! The Eagan location was much better than the Mall of America. I really liked the room with all the windows. The children singing at the end was just perfect. They looked so cute and they really knew the number. Katarina did a wonderful job with her new dance routine. She is quite a talented performer. 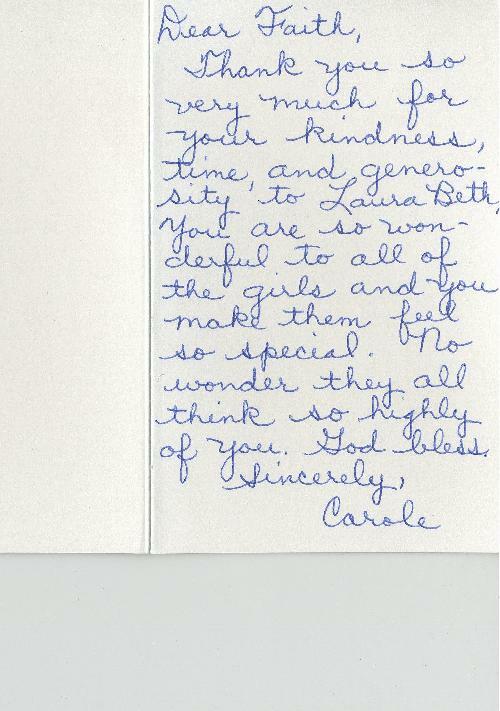 You have a wonderful talent of making each girl seem so special. I enjoyed listening to all the comments you had about the reigning queens. You looked beautiful and loved your outfit. Thank you so much for putting on a wonderful graduation and including us. 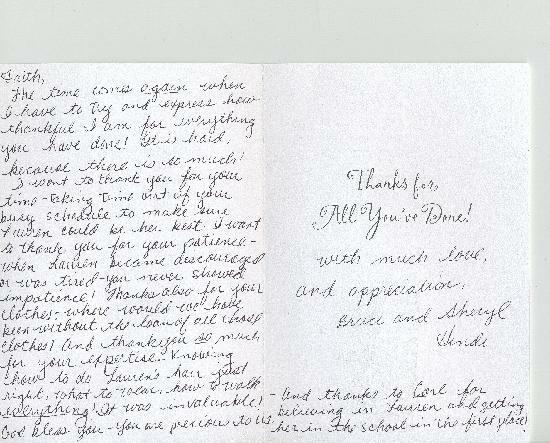 Dani felt honored to get to be a part of your program, and has enjoyed every minute of your school and working for you! You are a great inspiration and a wonderful role model! Thank you again for everything that you have done for us.